Next meeting will be held on Thursday, 29th June. Pres. Bryan (still acclimatising to our Winter weather after arriving home on Monday) welcomed Rotarians Gay, Noel S and Noel L and Rotary Partner Robyn. Apologies were received from Sec. Heather, Rtn. Graeme & Rotary Partner Jeanette. June is designated as “Rotary Fellowships Month” by the RI Board to recognize the importance of international fellowship and good will among Rotarians with similar recreational interests, vocations, and health and medical issue-oriented interests, to promote increased participation in fellowships and increase understanding of this program. There are currently some 64 Rotary Fellowships across an incredibly wide span including Caravanning, Cricket, Cruising, Cycling, Golf, Lawyers, Music, Photography, Recreational Vehicles, Travel and Hosting, Wine, Yachting. 2017 World Convention Along with a group of District 9800 Rotarians Pres. Bryan spent 18 days touring parts of U SA. After spending 5 nights in New York City, seeing the sights, the group travelled by train to Rochester, New York where they were home hosted by members of Rotary Club of Bloomfield. A delightful time was spent in the Finger Lakes area of upstate New York State . Attending the 2017 World Convention in Atlanta, Georgia, in the company of some 40 thousand Rotarians from throughout the World, was certainly a experience to remember. From the opening session, through to the closing session, including the President recognition lunch and the Foundation Birthday function, there was the opportunity to gain greater knowledge of the work of Rotary in the World. Pres. Bryan presented the banners he had been given during his trip to the US. 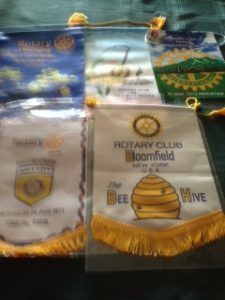 While being hosted by the RC of Bloomfield in Rochester NY, Bryan presented RC Rochester banner along with our 50th Anniversary Book to the Club. Bryan had the opportunity of attending the CO Function at the RC Bloomfield, an occasion he described as rather casual. Prior to his departure to the World convention, Pres. Bryan attended the District 9800 Gala Foundation Dinner in Melbourne.